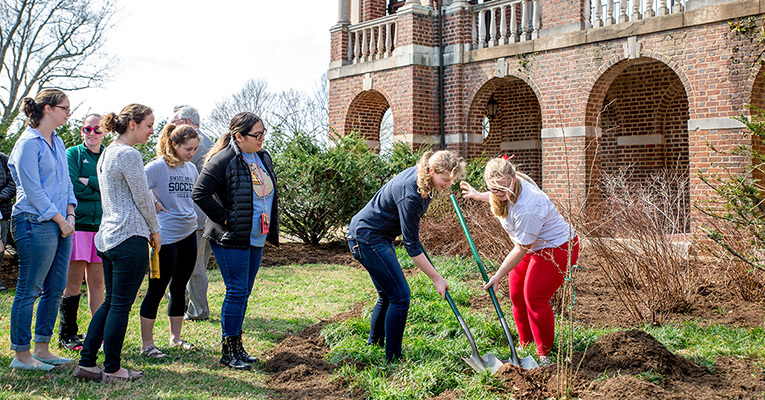 Students participate in the planting of a new rose bush to kick off Sweet Briar Forever Month. To celebrate Sweet Briar’s successes over the past two years, and to usher in Sweet Briar Forever Month, President Phil Stone for the second year planted a new rose bush beside the bell tower. Ultimately, it will be “a very full rose garden,” he promised the students, faculty and staff who gathered for the occasion. In last year’s ceremony marking the anniversary of the near-closure and celebrating the community that saved the College, Stone planted the first rose bush, calling it a “symbol of our solemn and sacred pledge.” Today, after a remarkable recovery, he planted a second bush. Students, faculty and staff members helped fill the hole with soil, and mulch around the new planting. Moments later, the noon bells rang out across campus, kicking off Sweet Briar’s Day of Giving and a monthlong focus on the College’s financial sustainability. Today’s goal is to raise $500,000. Between now and March 10, Indiana Fletcher Williams’s birthday, the target is an additional $500,000. This is the last time that President Stone will preside over the March celebration. 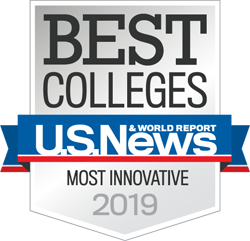 Next year, President-elect Meredith Woo will honor all those who ensured that the College lives on, demonstrating for the world that Sweet Briar women embody confidence, courage and grit.